Toast the rolled oats and almonds in the sunflower oil in a pan. When lightly brown, remove from heat and drizzle with honey, stirring to coat. Set aside to cool slightly. 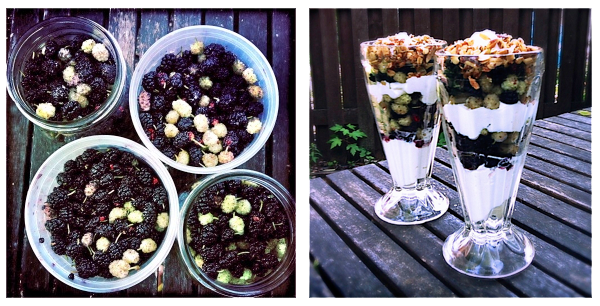 In tall glass soda glasses, layer in a spoon full of yogurt, berries and almond mixture. Make at least 2 layers of each. Top with an additional dollop of yogurt and serve. Make 3 to 4 servings, depending on glass size.